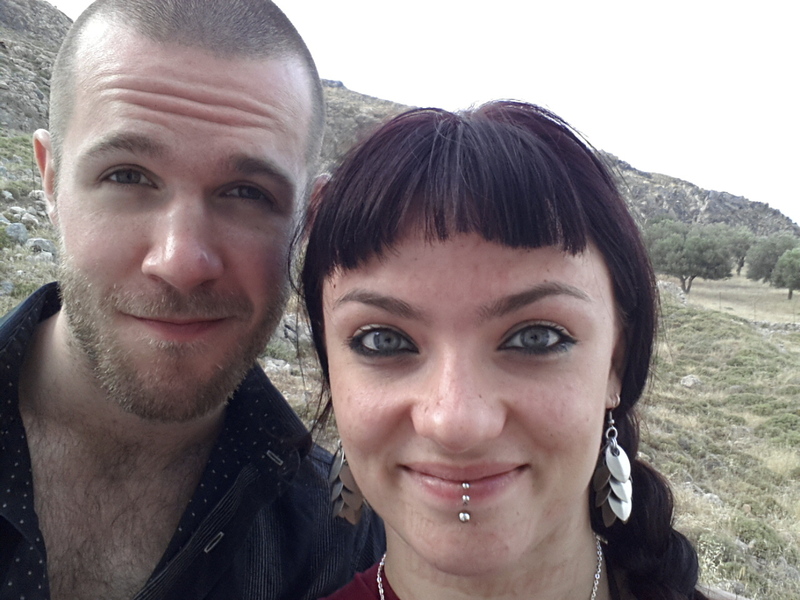 For those of you who followed and enjoyed the Written in Skin project, Loren and Stefanie will soon embark on their second collaboration, a living art piece entitled KAIROS presenting an alternative model of time in a 10ft mechanised time piece. Again the piece will involve live fine art, physical endurance, painting and poetry and will be showcased as a free live event at the Cornerhouse, Manchester – January 31st and the wheel will be left for exhibition on 1st Feb.
Stefanie will be strapped to the centre of one of the wheel’s concentric rotating circles. The wheel itself is designed to be an alternative clock that Loren will paint and transcribe the poetry of strangers onto as well as an elemental mandala throughout the performance piece. In it she discusses the relationship between Hélène Cixous’s theory of l’ecriture feminine, performance art and the poetic potential of pain. You can watch this lecture on Youtube here. 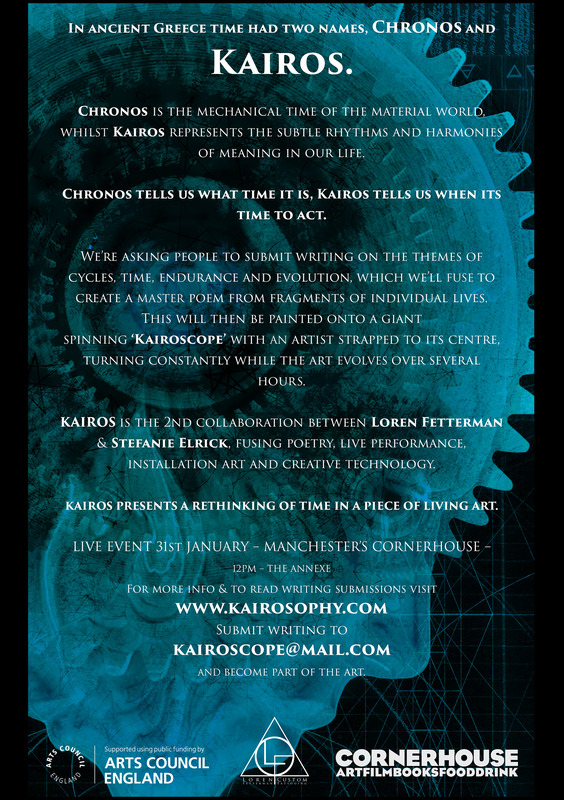 Stefanie’s next project KAIROS will be held at Manchester’s Cornerhouse, 31st Jan / 1st Feb. This little hope that’s all there’s left to feel. 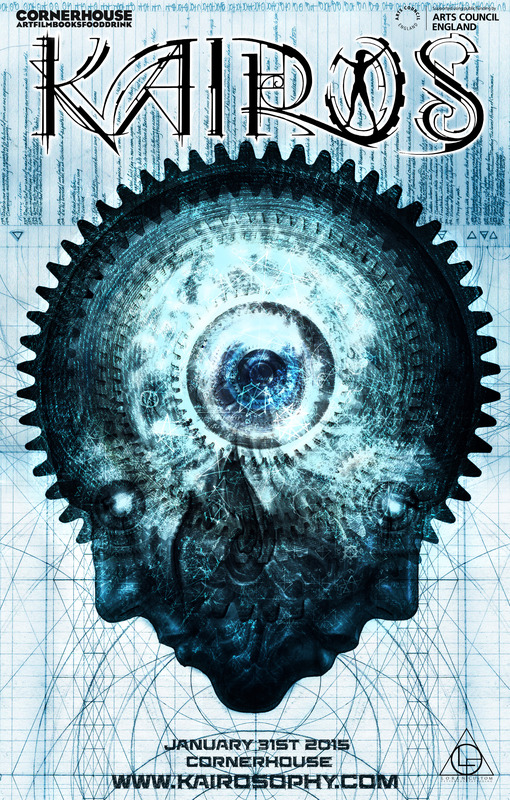 A centre in a world of unending unreal. Words on buses, and packaging, and people’s skin. In meaningless scribbles there hides a religion. I’m wondering without allowing conclusion. Of silver in the warm blue sun’s diffusion. Stretches no further than the tips of our duvet. Are you scared? I am. We’ll be okay. At night this ghost slips into your room. A fitful vision of love in bloom. You’re weird and you’re short and yer Mam tells me you’re gay. A dying planet, far, far away. I allow my mind to follow the rhythm. I looked so deeply I breathed you in. You’re brain processes faster and makes new connections. Rotting my flesh and sucking my senses. Mortality melts as I decompose. In space and silence. In silence alone. Before me like carpet spread out on the floor. You might have no business sleeping with virgins. Why do my dreams always feel like a war? I’ve run out of reasons to ever turn back. The time is right now, this dark night takes hold. That haunt and guide us, from young to old. He interrupts – I fall out of time with you. When you don’t make them feel self conscious about it. Challenge what you think and why. Thanks to Jamie Alun Price for editing the video and Dave Petty at Cornerhouse for capturing it. By this point EVERYTHING was itchy like crazy and I was essentially an all-you-can-eat buffet for mosquitoes. Everything was scabbing and drying up nicely and my face had completely healed by Day 5. Some simple pencil sketches from our week in Greece after Written in Skin. I have a real problem keeping still and Loren has to capture me reading or sleeping, even then I often shuffle about (hence the odd head in the second sketch).